The latest edition of GCU Today Magazine tees up a cover story on the newly renovated Grand Canyon University Golf Course and what it means to west Phoenix and to the University. See why it’s such a big victory, and watch a video that shows off the transformation from Maryvale Golf Course. 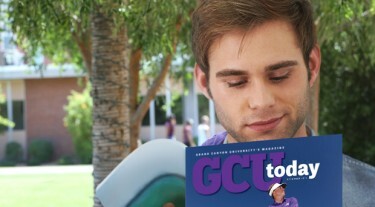 The December magazine also features an inside look at how GCU students are being the hands and feet of Jesus in the community, introduces you to five recent graduates of the College of Fine Arts and Production who are having lots of success in the working world, traces the University’s origins as the Antelopes and the evolution of its popular mascot, Thunder, and offers a behind-the scenes look at our own Thunder Dan Majerle.